Members of the million-strong landless movement in Brazil (MST) have invaded a farm owned by biotech giant Monsanto in the central state of Goias. It is the third protest of this kind against Monsanto property this year, and the company has urged the government to take back the land, warning that repeated invasions "damage the image of the country". It has filed for a repossession order from a court but no decision has yet been announced. There is torrid debate in Brazil over whether genetically modified (GM) crops should be let in amid mounting pressure on the government from the multinationals. Local newspaper reports say between 200 and 2,000 people invaded the 307-hectare farm in Santa Helena de Goias on Monday morning. Monsanto says the centre is used for research, training and seed-processing. The MST says the centre is being used to grow and stockpile seeds, ready to flood the market if GM is legalised in Brazil. "It's an illegal centre," said one MST leader, Luiz Afonso Arantes. "They might be producing seeds just for research, but they are also planting with the intention of reproducing," Agencia Folha quoted him as saying. 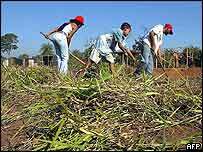 The MST has expressed fears that if GM is made legal in Brazil, big growers will force small farmers out of business. But in a statement, Monsanto said: "Repeated invasions like this one, as well as compromising the progress of science in Brazil, damage the image of the country on international markets and threaten the development of national agriculture." It said failing to crack down on land invasions jeopardised international investment in Brazil. Brazil's new Workers' Party government has expressed sympathy with the aims of the huge MST, but the two have clashed over the pace of agrarian reforms. There is furious debate over GM crops in Brazil. Many farmers argue that by allowing them in, Brazil will lose lucrative markets for non-GM foods. Others fear the creeping introduction of GM crops to Brazil, in part through leakage from neighbouring countries. Earlier this year the Brazilian Government agreed that a large soy crop in the southern state of Rio Grande do Sul found to have been tainted by Argentine GM soy could be sold, but said the moratorium on GM crops there would be reintroduced next year.